Dustin and I met in October of 1998. We were young. Dustin was geeky. We instantly fell in love. Seven years later, wearing kilts, we said “I do.” It was beautiful, romantic, and hot. Not in the steamy way, friend. Seriously, it was 100 degrees. It was HOT! Our first couple of years as “man and wife” were rough. I discovered Dustin had a “thing” for throwing dirty laundry on the floor (with zero intention of picking it up). He discovered I really couldn’t cook. The cooking threw a bit of an uneasy wrench in the mechanical workings of our new marriage. After two weeks of burnt and greasy eggplant parmesan and chicken breasts (talk about variety), Dustin took matters into own hands. The poor man was hungry and I was tired of being the good wife with a meal on the table at 5pm. Plus, we were broke. Dustin introduced me to the way of a bachelor. A processed food bachelor. To get through college (we all know how crazy expensive four years of classes and books can be), Dustin learned “tricks” to cut down on the expense of eating. Soup from the can to the pot and served with fancy metal spoons (the plastic was reserved for far less formal occasions) and individually wrapped twenty-five cent burritos found their way into our marriage. I’ll confess, the taste was far from superior. Each time I sank my teeth into one of those bean burritos I questioned how anything “real” could cost so little and taste so bad. Years later, Dustin and I made the daring decision to change our eating habits and stop buying freezer burritos and canned soup. If you’ve been around the Live Simply, then you know our story: a dare turned into veganism which turned into real food, including bacon, and a blog! After a few months of eating “real” reality set in: if we were going to eat real, we had learn to plan and cook! Without either skill (which are learned) real food just doesn’t work for a long-term lifestyle. Yes, I’ve learned to cook! Hooray! In fact, I even write a blog now that talks a whole lot about food. Dustin loves pretty much everything that comes out of my kitchen these days. A huge relief. If he doesn’t, we have eight chickens to feed. All problems are solved, right? Well, now we have a new problem. See, once you learn how to cook, “other food” just doesn’t taste that great anymore and spending money on food that’s not very tasty or wholesome is less than appetizing. I’d love to cook everyday, but sometimes a gal just needs a break and a good shower (with homemade body wash). That, my friend, is when freezer meals come in handy. No, no! Not freezer meals from the store. 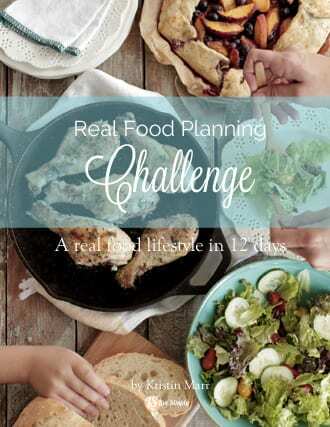 I’m talking about homemade freezer meals that you’ve planned in advance and made on your prep day (which you know all about from taking the Real Food Planning Challenge). 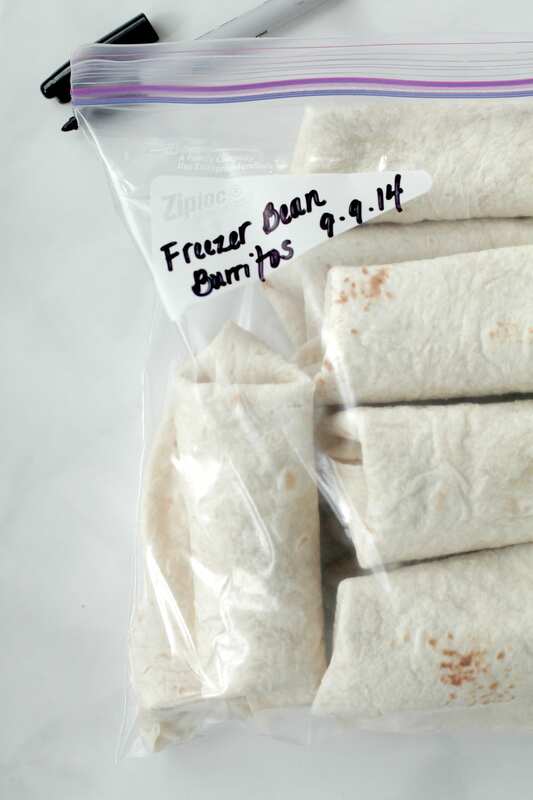 Homemade freezer bean burritos are one of my go-to freezer meals. A tasty and healthy reminder of the burritos Dustin and I consumed (and survived) as newlyweds. 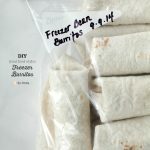 Homemade freezer bean burritos are frugal (costing just pennies per burrito) and can be topped or filled with anything your tummy desires. With homemade bean burritos in the freezer, I can take time to enjoy an effortless meal the real food way. 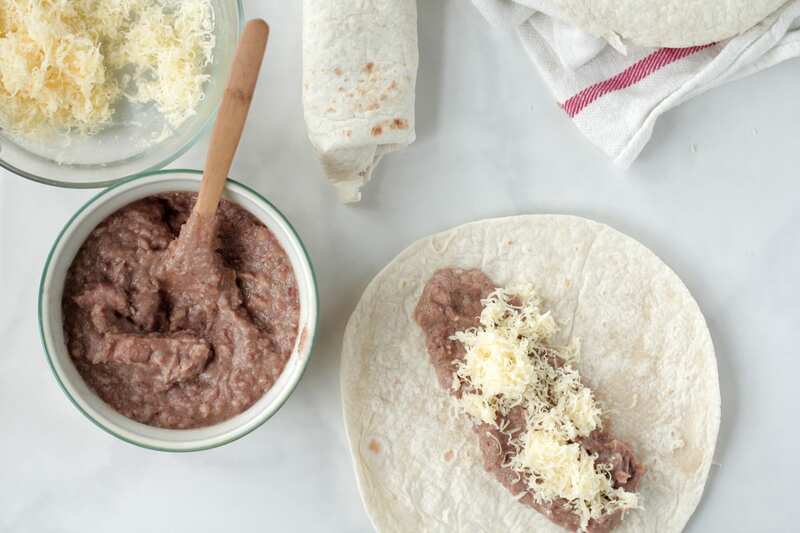 Homemade freezer bean burritos are one of my go-to freezer meals. A tasty and healthy reminder of the burritos Dustin and I consumed (and survived) as newlyweds. Once the beans are soft, drain the beans retaining 1/4-1/2 cup of water to use for pureeing the beans. You may not need all this water. Use an immersion blender (like this) to puree the beans, adding water as needed, making refried beans. Mix the cumin, chili powder, salt, and garlic powder into the refried beans. 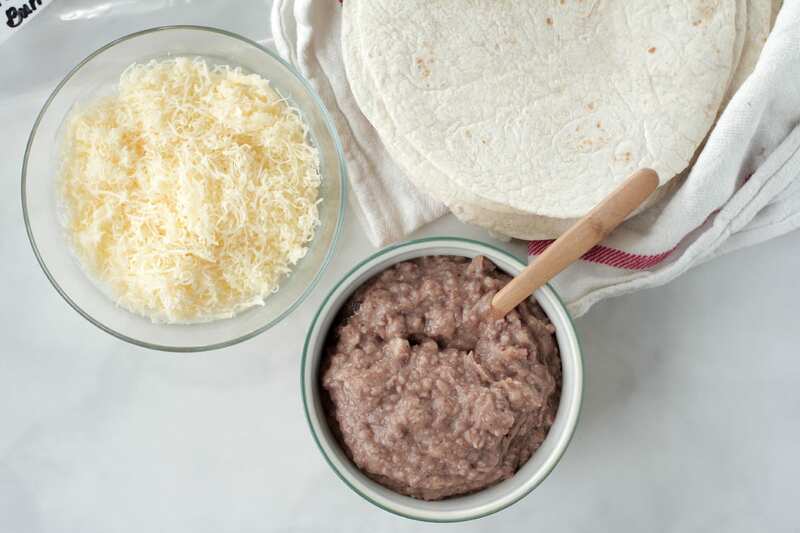 Add 2 tablespoons of bean filling and cheese to each burrito. Then, roll the burritos. You may have an extra cup of filling. Freeze the extra or enjoy as a snack. 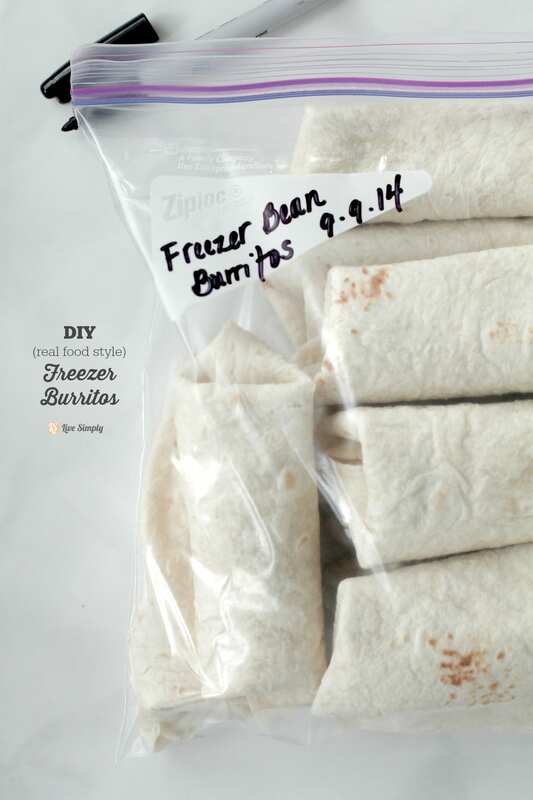 To defrost, place the desired number of burritos in the fridge overnight and warm in the oven at 350F before serving. Or you can defrost, straight from the freezer, in the microwave or oven. 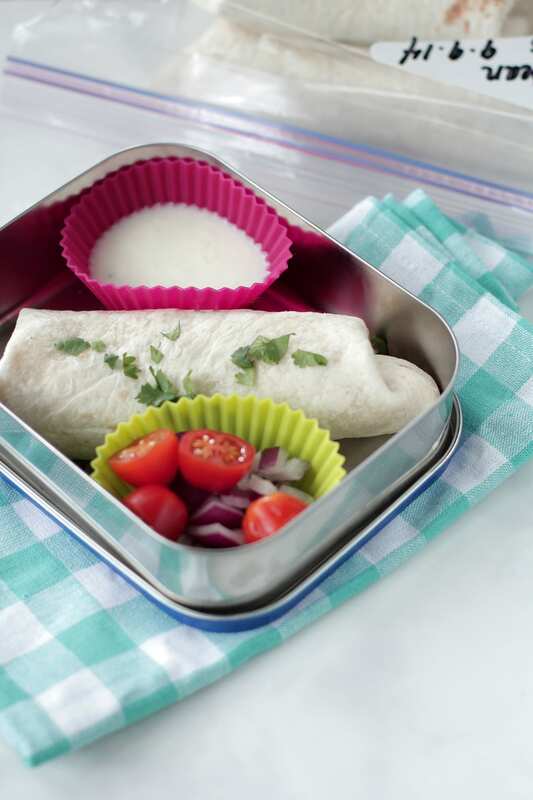 Burritos can be warmed for 10-15 minutes in the oven or 2 minutes in the microwave. *I enjoy two brands of store-bought tortillas: Stacy’s or Food for Life. If you’d like to make homemade tortillas my favorite recipes are: Soaked Whole Wheat Tortillas and Whole Wheat Tortillas. Reheating Tip: If you’re using sprouted tortillas, wrap each one in a damp pamper towel before reheating. This will help keep the tortillas from drying out. Thanks, Medha! They are way better :). These sound amazing! I’m also excited to see a recipe for homemade tortillas!!! We are really trying to clean up our act around here. I’m starting with our skincare and cleaning products sunce we eat fairly well and are mid-move. 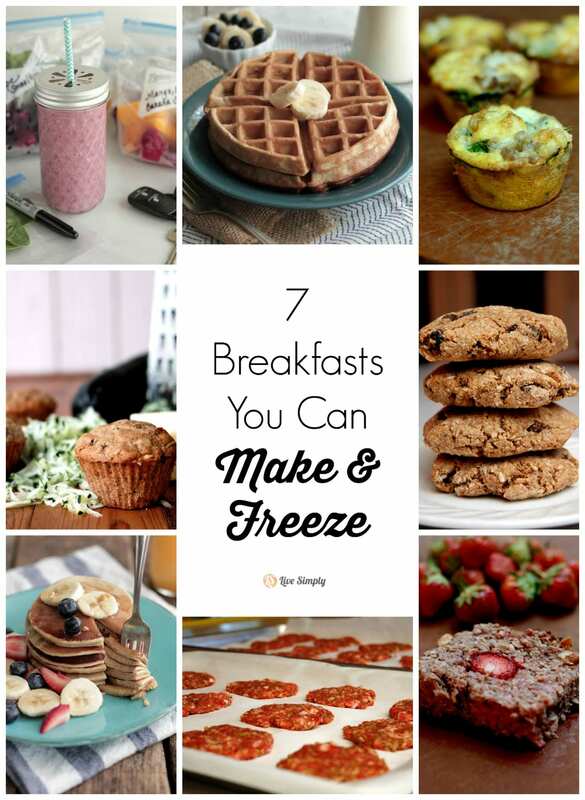 I can’t wait to try some freezer recipes once we are in our new house!! Thanks! Thank you, Lindsey. They are so yummy. Enjoy!!! What size tortillas are you using? 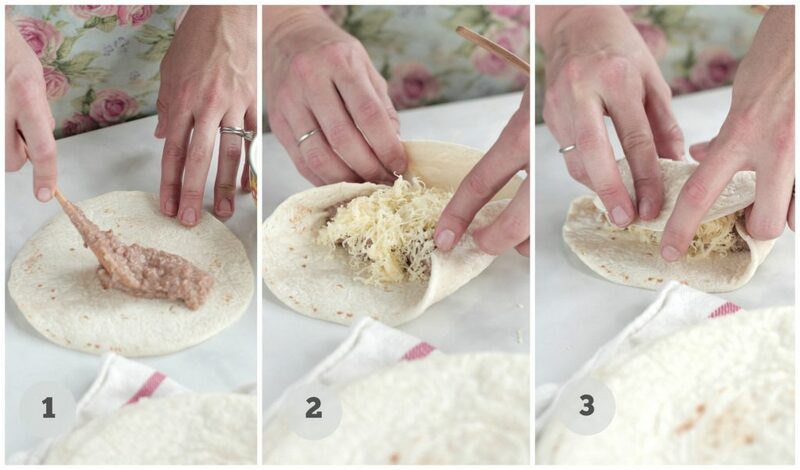 Susan, I use both fajita/soft taco and burrito-size tortillas to make these. Both work very well. These are AMAZING! I’m so glad I ran across the recipe. I never knew how delicious beans could be!!! Thanks for sharing. My whole family loves them and they’re perfect for my hubby to bring to work for lunch. Hey Brittany, I’m so glad your family loves the burritos!! Beans can be pretty bland, but with the right spices (like this recipe), they are absolutely amazing. 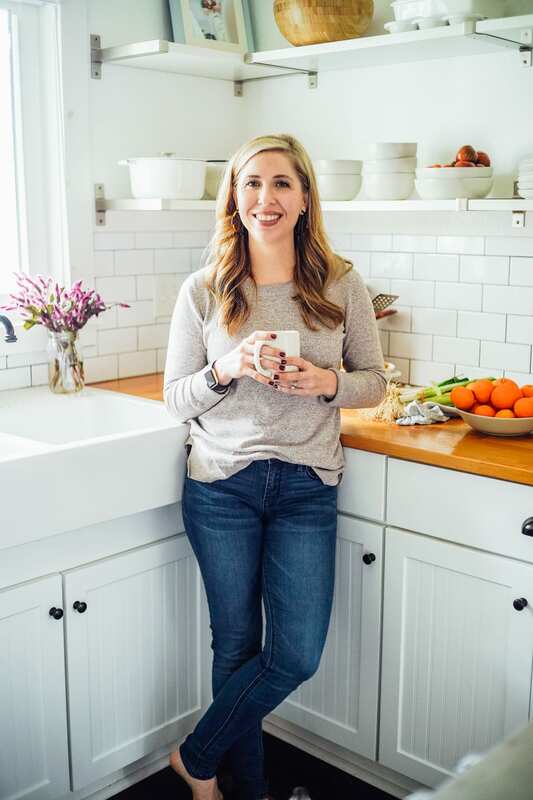 We have a breakfast burrito recipe coming out this week here at Live Simply that I think you’ll also enjoy! Have you tried adding ground turkey (or beef to these)? Do you think it would work the same? Hey Alexis, Cooked ground beef (or turkey) is a great addition! I’ve added beef many times.